I love Erik Larson's writing. His non-fiction books read like fiction, but they are really and truly non-fiction, and he spends hours researching his topics and the people he writes about. I highly recommend this book to anyone interested in 19th century American architecture, the Chicago World's Fair of 1893, or Gilded Age anecdotes.. This is the fair that shaped America and put it on the world map. The exposition covered 690 acres with nearly 200 new, but definitely temporary buildings. The fair was called The White City because of all the beautifully white buildings. It was a magical place. More than 27 million people attended the fair during its six-month run. It is a story about the chief architect of the fair - Daniel H. Burnham and the fleet of architects and specialists he recruited to help design his monumental accomplishment. There are so many well-known historical figures in the book, such as Susan B. Anthony, Frank Lloyd Wright, Thomas Edison, Buffalo Bill and many others. 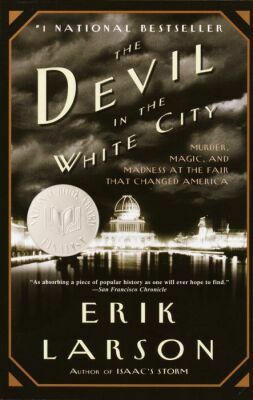 There is also a parallel story in the book that follows another person of infamy who was connected with the fair - H. H. Holmes, an American serial killer who was responsible for an untold number of deaths. His victims were mostly young women who were unaccompanied as they came to Chicago to visit the fair. Why Holmes was allowed to continue the macabre torture and murder of so many poor souls without even being suspected is hard to imagine. He was a particularly charming sociopath, who was very attractive to young women. I loved the juxtaposition of this particularly sadistic murderer and the beautiful, magical White City of the World's Fair. Larson's talent is that he makes history come alive and he has done that with this book. Well worth the time to read.